The Honorable George Lincoln Bunn was born on June 25, 1865 in Sparta, Wisconsin. His father, Romanzo Bunn was both a Wisconsin Supreme Court justice and United States federal judge who influenced him to practice law. George Bunn received both his undergraduate and law degrees at the University of Wisconsin. Bunn moved to Saint Paul after graduation in 1888. It was in Saint Paul that he met and married Ella Spaulding, who died one year later. He would not marry again until 1908, when he married Fanny Losey of Lacrosse, Wisconsin. Judge Bunn was appointed a judgeship to the District Court of Ramsey County in 1897. In 1911, Governor Adolph Olson Eberhart appointed him to the Minnesota Supreme Court. 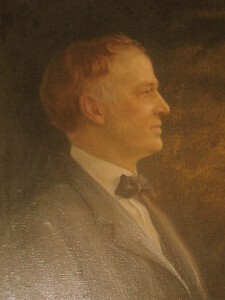 Bunn served as dean of the St. Paul College of Law, the first predecessor of William Mitchell College of Law, from 1904 until his death in 1918.